Agriculture in California is highly diverse in terms of food production, crop management, ecosystems, and climate. Nitrogen fertilizer is essential for crop food production. Nitrogen fertilizer use over several decades in California has led to nitrates in groundwater. Recognizing that nitrates from agricultural nitrogen fertilizing materials have entered some California groundwater systems used for drinking water, CDFA convened the Nitrogen Tracking and Reporting Task Force in 2013 as part of a multi-pronged administration effort to address nutrient management and water quality. This charge was achieved through several measures including, among others, understanding and discussing the pros and cons of existing nitrogen tracking and reporting systems, identifying desirable components or elements of existing systems and evaluating the variability and complexity of California agriculture in relation to where existing systems have been implemented. Through several meetings, presentations by subject matter experts and discussion, the Task Force members came to general agreement on several components of an effective nitrogen tracking and reporting system. The recommended system addresses eight key topics including: (1) System Structure; (2) Data Elements; (3) Roles, Responsibilities and Data Accessibility; (4) Benefits of Participation; (5) Verifiability; (6) Societal Benefits of the Recommended System; (7) Limitations and (8) System Phase-in. 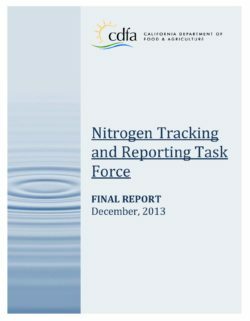 This report presents the Task Force’s discussions and recommendations including intended outcome and anticipated benefits of such a tracking and reporting system for nitrogen use.